2003 was truly a year of "great deals" for me. One of which was this 60 liter Norcold MRFT-60 fridge that I bought new-in-box for practically a song and a dance. A very special thanks to my friend Steve, who tipped me off on the deal. It was an older "freight damaged" unit that uses freon refrigerant, and had some minor cosmetic dents on the sheet metal body that encases the motor assembly. But other than that, it was brand new and works perfectly. I was pretty well awestruck considering this unit retails for approximately $1,000 US as a current model with the new refrigerant. This is essentially the same fridge that is marketed and sold with the Engel and ARB brand names. It has the patented Sawafuji swing motor, and can operate at angles up to 30 degrees. It has a dual voltage motor (operates on 120v AC or 12v DC) and is quite efficient. Based on my understanding, this unit uses a burst of about 5.5 amps to start the motor, and then the motor will run on about 2.5 amps continuous power. There is an adjustable thermostat, so the motor only runs as long as necessary to maintain the desired temperature. It will make ice :) I had long dreamed about finding a way to get a fridge/freeze into the Tacoma, and now that I have one I am quickly getting spoiled :) No more worries about melted ice and soggy sandwiches. Although, the nice thing about ice coolers is that they require no electricity. Since getting the fridge, I decided to add an auxiliary battery so there would be no chance of draining my starting battery and getting stranded somewhere with a bunch of cold refreshments. 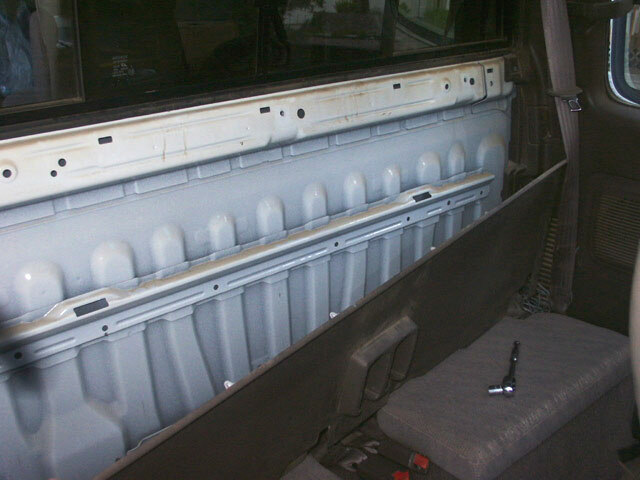 Here is a view of the Tacoma Extra-Cab prior to the fridge installation. 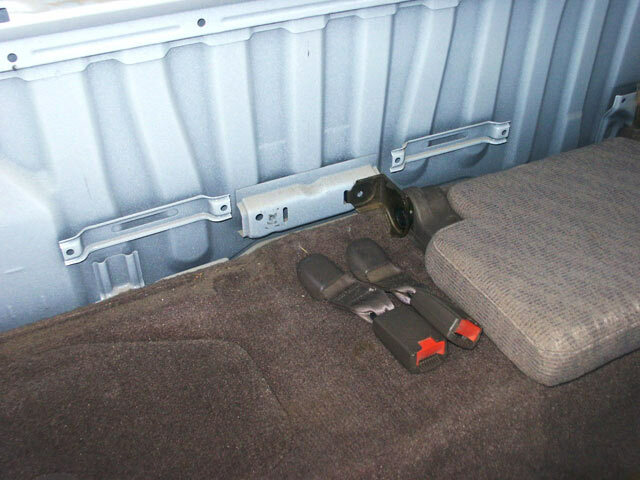 As you can see, there are two fold down bench seats (or "dickey seats") and I have my old Kenwood speakers strapped in for the ride. 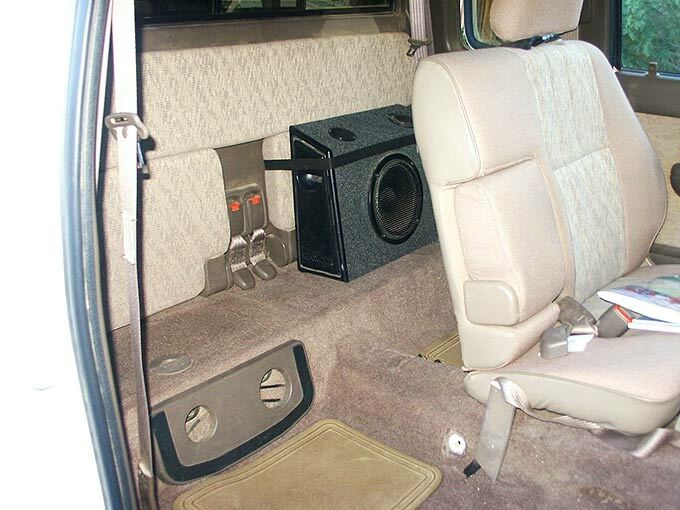 I liked having these speakers because they produced a decent full-bodied bass sound, but were removable for when I wanted to carry passengers. That was all about to change. 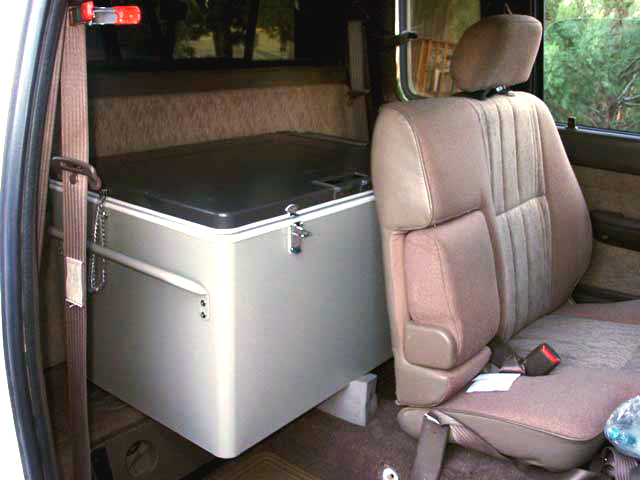 I did some preliminary fitment, and found out that the fridge would indeed fit back there (I was relieved!) but it would require some modifications in order to keep my usual driver's seat position, and allow the lid to pivot up to the fully open position. As you can see in this picture, the fridge hangs out well past the dimensions of the stock bench. So, I would have to make the bench deeper in order to fully support the fridge. I decided to use this added depth as a permanent home for my old Kenwood speakers, which you will soon see. ...and unbolt the seats and center seatbelts.